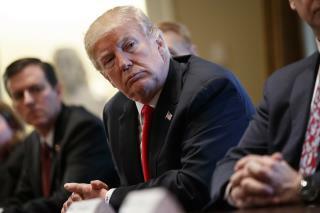 (Newser) – President Trump announced new tariffs on imports of steel and aluminum—25% and 10% respectively—on Thursday, leading some experts to fear a global trade war, the New York Times reports. "Our Steel and Aluminum industries ... have been decimated by decades of unfair trade and bad policy with countries from around the world," Trump tweeted Thursday morning. "We must not let our country, companies and workers be taken advantage of any longer." Experts say the tariffs could lead to retaliation from other countries (China is talking about tariffs on US sorghum and soybeans and the EU is considering tariffs on US cheese and bourbon), higher prices on goods using steel and aluminum, and possibly an economic slowdown. Nervous investors sent the Dow plunging 500 points immediately after the news broke, reports the AP. Winning winning so much winning from this sob. Wait, wasn't Trump just crowing about how great the stock market was doing? Most shocking thing about this article is that the EU imports American cheese.